I use grilled chicken in many of my recipes…..so that requires making grilled chicken about once a month. My husband does it (nice guy) and I usually make the side. We had a warmer day last week that worked perfectly for grilling and I decided to make fall salad to go with it. Bosc pears are my favorite. They keep much better than other varieties. Best of all they are sweet when they are still crisp. I don’t care much for soft pears. Combine them with avocados, which are pretty easy to find now and feta and you have something to look forward to eating. 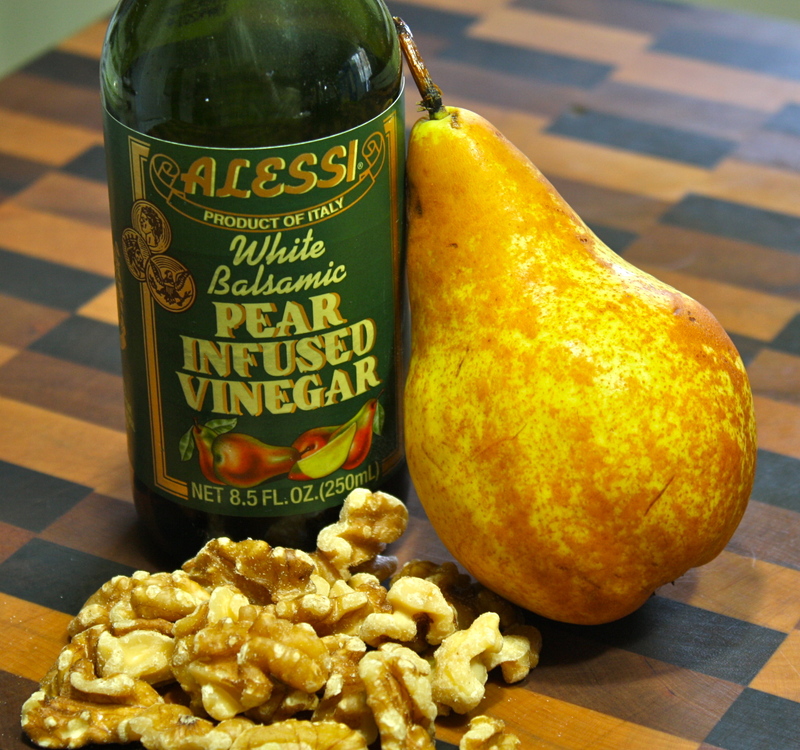 I use a pear infused white balsamic vinegar in an otherwise simple dressing with stone ground dijon mustard, honey and fresh thyme to bring the flavors together. Use spinach, romaine, or mixed greens if you like. A little red onion goes along nicely for the ride. My youngest son had yet to taste avocado and this salad was a good introduction for him. I served some simple garlic bread crisps with it. 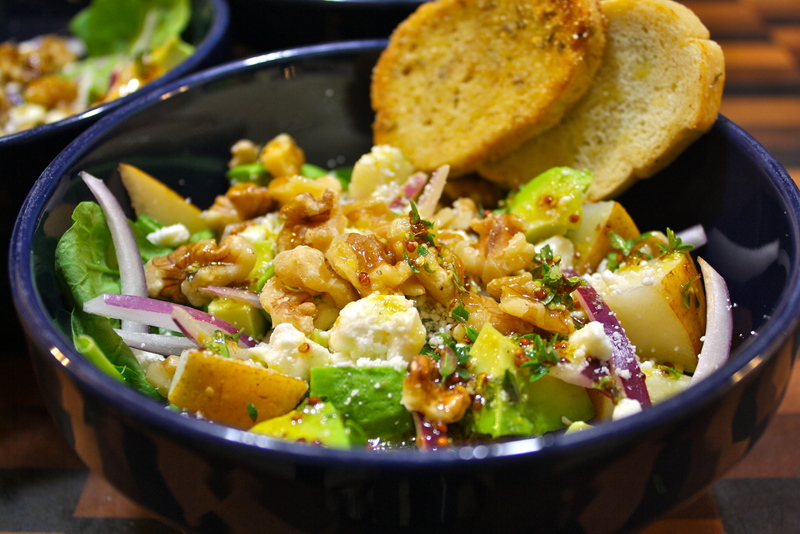 This salad is a quick fix but looks fancy enough for company. Try it soon for a fresh change. Combine vinegar, mustard, and thyme. Whisk in oil to emulsify. Taste and add salt, pepper and honey to suit. Set aside. You will to give it another quick whisking before you add it to the salad. 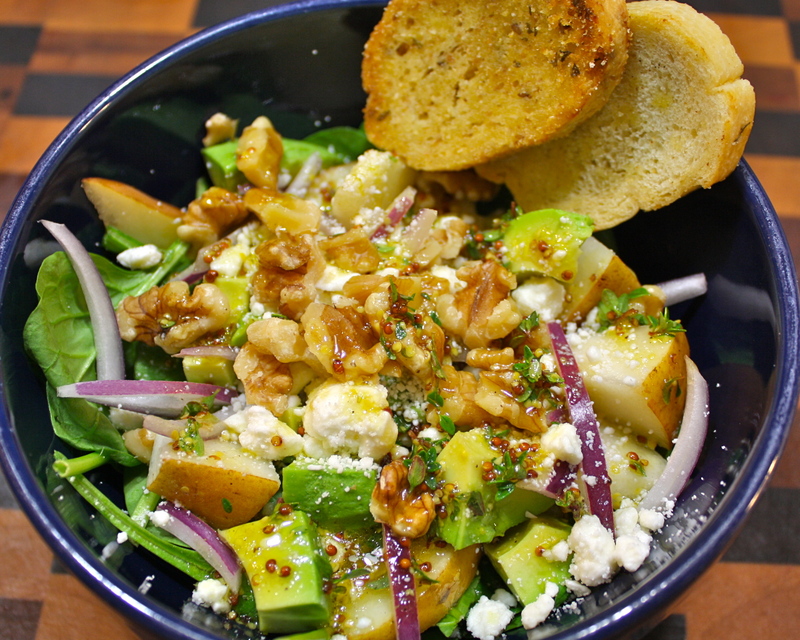 In individual bowls, place greens, then top with pears, avocado, and red onion. Sprinkle onions and feta over them. Spoon dressing over salad just before serving. Enjoy! Lovely and fresh. I am just imagining all the different tastes included in the salad melding together harmoniously! A feast for the eyes and stomach! This looks fantastic! I am excited to try it. I am hungry and I am looking through your post. It is making me more hungry, and I brushed already! I know the feeling….glad I was able to make you salivate! Thank you very much…the same to you and yours!